Japan has 47 prefectures and each region has its own regional cuisine which makes use of regional ingredients and special methods of cooking. Each cuisine has its own historical background and is suitable for that region’s particular climate. It might be meals, sweets, fish or fruits but the food has been familiar to the locals’ home for a long time and you can find restaurants or shops that supply the food locally. Japanese regional cuisine is called “郷土料理 Kyoudo ryouri“. The regional food, processed products, crafts or alcohol are called “特産品 Tokusanhin” or “名物 Meibutsu“. In this article, I will introduce you to three well-known regional cuisine or kyoudo ryouri: Kiritanpo from Akita, Yudoofu from Kyoto, and Chanpon from Nagasaki. きりたんぽ Kiritanpo is a skewered pounded rice cake originated in 大館 Odate area in 秋田県 Akita prefecture. A long time ago, people who lived in the mountains doing hunting or farming made the food with their leftover rice. The rice was kneaded and wrapped around a wood stick which then was eaten with miso paste or in a hotpot. This was the birth of tanpo. Tanpo is originally a spear cover which is wrapped around the blade part but looks similar to the Tanpo, so the food was named as such. “Kiri” means “cut” in Japanese, so chopped tanpo in a hotpot is called kiritanpo. Kiritanpo is cooked as “おふくろの味 Ofukuro no aji” at local homes. “おふくろの味 Ofukuro no aji” means “taste of mother’s home cooking”. Maybe 味噌汁 Miso shiru (miso soup), 肉じゃが Nikujaga (meat and potatoes) and 唐揚げ Karaage (deep fried chicken) could be Ofukuro no aji for many Japanese. 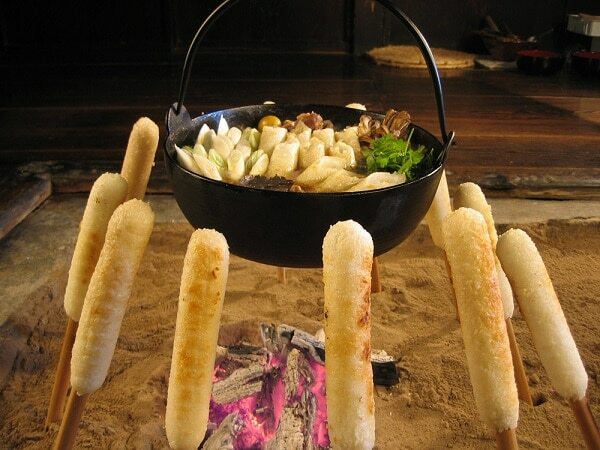 たんぽ Tanpo : Chargrilled pasty steamed rice wrapped around a stick which is made of Akita-sugi (cedar) is called tanpo. 味噌付けたんぽ Misozuke tanpo : Tanpo with miso sauce or soy sauce. きりたんぽ Kiritanpo : Hotpot with chopped tanpo and seasonal vegetables, mushrooms and chicken. 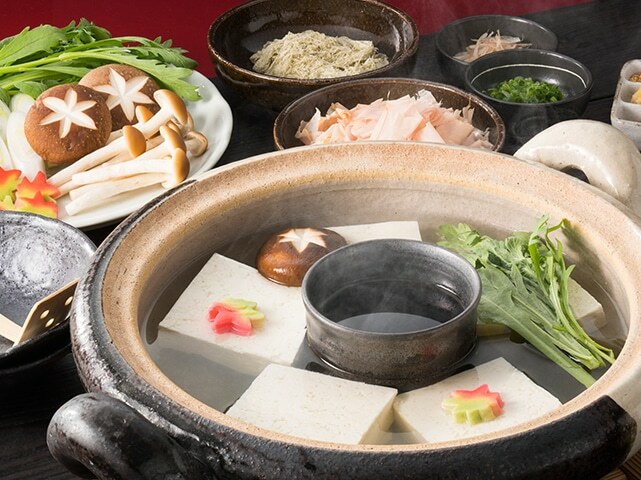 Kiritanpo often refers to this hotpot rather than tanpo on its own. Tofu was brought to Japan by the monks for Japanese missions to Tang China (遣唐使 Kentooshi) in the Nara period (710-784). There is no clear record about tofu but it was a special food which was eaten by a few monks and nobles at that time. It is said that the origin of Yudoofu was 精進料理 Shoojin-ryoori (the vegetarian dish for Buddhist monks) in 南禅寺 Nanzen-ji (Nanzen temple). In the village, special days such as 祭り Matsuri (seasonal festivals), お盆 Obon (a traditional summer time period to welcome the souls of ancestors), お正月 Oshoogatsu (New Year) and 冠婚葬祭 Kankon-soosai (ceremonial occasions) are called ハレの日 Hare no hi (Sunny day). “ハレの日 Hare no hi” is often used for a very special day even today. Yudoofu used to be served on “ハレの日 Hare no hi” in Kyoto. During 鎖国時代Sakoku-jidai (national isolation period 1639-1854), Nagasaki was the only open port to accept foreign culture, so this town built up a very original culture, which is characterised by the regional food, especially ちゃんぽんの皿うどん Chanpon no sara udon (a fried noodle dish topped with seafood, vegetables and thicken sauce) which was related to China. 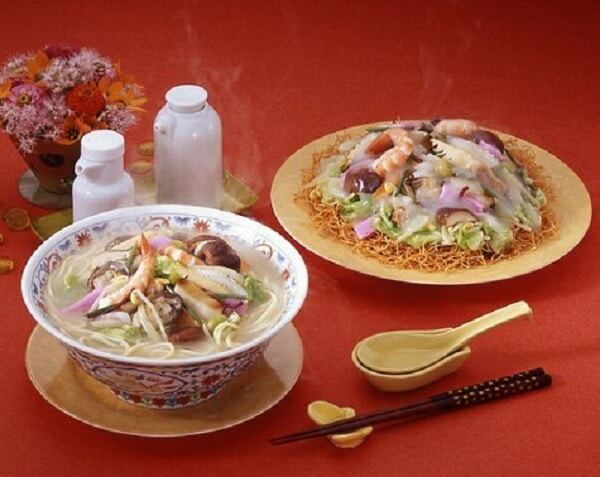 Nagasaki created this Chinese and Japanese mixed cuisine as a common food. The origin of the word ちゃんぽん Chanpon had several different stories. The first one comes from the direct 喰飯 Shanpon (quick and easy meals) in 中国福建省 Chuugoku Fukken-shoo (Fujian Province, China). The second one is from Portuguese word “mix”. The third one is the combination of the word チャン Chan (Chinese) and ポン Pon (Japanese) = チャン＋ポン Chan＋Pon. Furthermore, there is a documented record that the historical person勝海舟 Katsu Kaishuu (naval engineer/statesman) ate chanpon in 丸山 Maruyama and he was very pleased. In 明治 30 年代 Meiji-period (1897), Chinese people from福建省 Fukken-shoo were doing business by selling food in Nagasaki town, and 陳平順 Chen Pin Shun provided Chinese students nourishing noodle soup topped with vegetables and broken pieces of meat and he named the noodle soup chanpon. This anecdote could be the origin of the word as well. Learn Japanese before your next trip to Japan with our short courses.